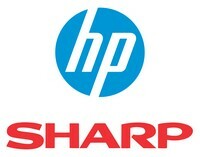 Sharp Corporation is now considering providing MFPs to Hewlett Packard. Some months ago Sharp was considering a joint venture with Samsung Electronics. Talks with Samsung ground to a standstill, in part because of pressure in Japan not to provide the technology to the South Korean manufacturing conglomerate. The deal Sharp is considering is to provide HP with A3 copiers which would be rebadged and marketed as HP machines, and also to provide toner and potentially other consumables and components to Hewlett Packard as well. Sharp is a major player in the copier world. Despite difficult times for all Japanese firms which have been particularly keenly felt by Sharp, they have turned their hard-copy output device business to profit in 2013. Becoming an OEM for HP should provide wide access to markets they have not been able to exploit hitherto. Sharp also recently entered the color production printing marketplace and launched two more innovative machines in September 2013.